easy-forex, one of the pioneering forces in global retail forex, has announced the winner of its $1 million trading competition, launched in March. 29 year old Shivanand Swami, from Marathi in India, who is currently studying the business of network marketing, was the top-performing trader by a clear margin. 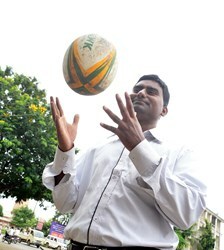 As well as winning a luxury trip for two to Australia, Shivanand will attend the final home game of the National Rugby League’s Canterbury-Bankstown Bulldogs in Sydney, 31 August. During halftime, in front of the home crowd in the ANZ Stadium, he will have the chance to kick for $1 million. easy-forex is proud to be an official sponsor of the Bulldogs. Joining Shivanand in Australia is the runner up, Liu Bin from China, who wins a luxury trip for two and $5000 in trading credits. The competition, one of the most exciting ever seen in the industry, gave new traders the same chance to win as pros. easy-forex® is an online trading group that was founded in 2003 and has revolutionised currency trading in over 160 countries ever since. With one easy-forex account, traders can trade currencies, commodities, options and indices using their web, desktop or mobile platforms. easy-forex is regulated in Europe and Australia and is committed to transparency and client fund security. Risk warning: Forex, Commodities, Options and CFDs (OTC Trading) are leveraged products that carry a substantial risk of loss up to your invested capital and may not be suitable for everyone. Please ensure that you understand fully the risks involved and do not invest money you cannot afford to lose. The information provided can under no circumstances be considered as a recommendation to engage in any trade.